Posted by The Grannies on April 23, 2012 . No comments. 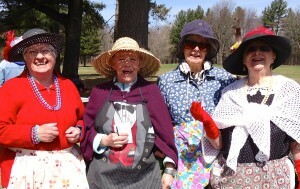 We regret to announce the Barrie And District Raging Grannies gaggle is inactive right now. For the time being, due to health concerns and other priorities, we are not able to function as a viable activist group. We will announce our return as soon as we become active again. In the meantime, people looking for a Raging Grannies group in the Barrie area can check the Locate A Gaggle page on the Raging Grannies International site at www.raginggrannies.org. BAD Grannies Anita, Rolande, Mariane and Molly sang at the Party In The Park on Sunday April 19, 2015 in Barrie’s beautiful Sunnidale Park. The event was organized by several groups as our local action in the Blue Dot National Day of Action, initiated by the David Suzuki Foundation. Blue Dot hopes to generate momentum in a movement in which we Canadians will stand up and insist we have a right to clean air, clean water, and healthy food free from pesticides. The Party In The Park event also celebrated Earth Day, which is this week, on April 22. 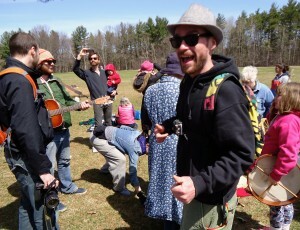 People came together to spend time, have a picnic, make some music and enjoy the sunshine. Someone with a video camera was shooting a video featuring Brett Caswell, Shane L. S. Dennis and Carleigh Atkins, including an original song, with drums. 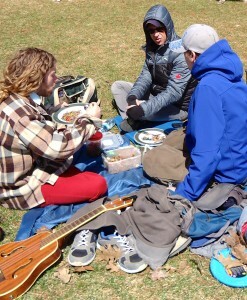 Yoga, meditation and dance were available at various locations in the park, and there was even hot soup. Thank you, to the organizers of this fine and fun event. An entertaining evening can always be found when Debbie Marks of Marks In Time hosts her “Show and Tell” events to try to instil in the rest of us the importance of telling our stories. Visit www.marksintime.com to learn more about the creative and more permanent ways Debbie encourages us to do this. I have already passed on most of my family treasures, and having talked about those I still have at previous Show and Tell sessions, I decided on March 10, to talk about one of my hats. One of my Granny hats! Only a few present had heard of the Raging Grannies, so I spoke about our history, the risks of arrest that some have experienced – risks that we recognise we take but are willing to take them anyway. 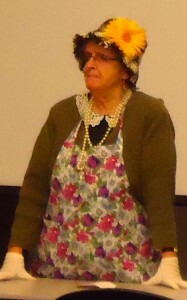 I then outlined the story of the BAD Grannies and some of the projects we have undertaken over the years. I demonstrated the manner of our protests by delivering a solo version of We Aren’t Going To Take It Anymore. It was the first time they had a presentation in song! 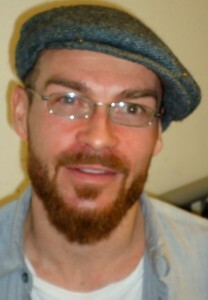 I felt the story of my hat, where it goes and what it does when there, was very well received. Posted by The Grannies on March 5, 2015 . No comments. 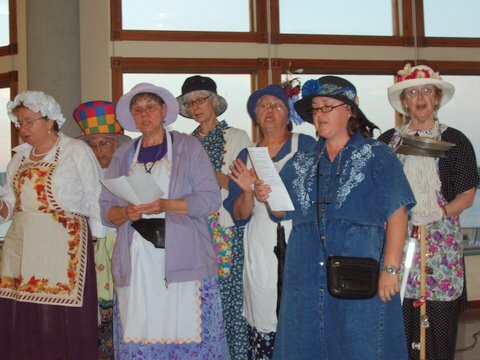 Here are some of the BAD Grannies, singing away at an event organized by the Laurentian University Social Work Association (LUSWA) for Social Work Awareness Week (March 2 – 6). The event, Activism: Some Assembly Required, was held at Georgian College on Wednesday March 4th, 6 – 9 p.m. It was described by LUSWA President Kris Eckenswiller as “a night of Community Speakers for students and community members of all ages to come and enjoy,” . 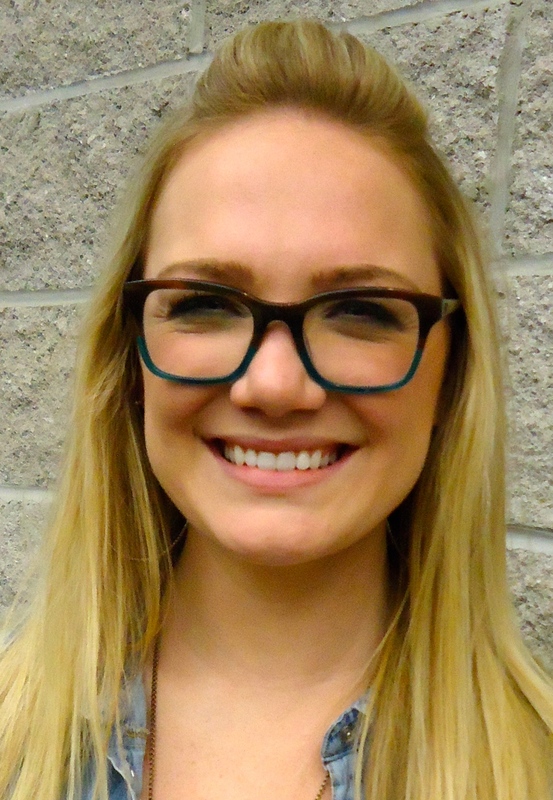 As a crowd of about 70 munched on sandwiches and other goodies, we BAD Grans and three other speakers explored the theme of Mobilizing Strengths As Individuals And Communities from our different perspectives. It was quite wonderful to hear about the interesting projects the speakers are involved in, and it’s most reassuring to see that the spirit of activism is alive and flourishing in our city. There are lots of caring people out there committed to making good changes happen, one Tweet, one photo, and one carrot at a time. To understand that, of course, you would have had to have been there. It would take too long to explain, but if you’re interested, track these speakers down and let them tell you what they are doing. Barrie photographer Laura Fess spoke about We don’t do that here, a project founded by teen youth to encourage their peers to challenge the overwhelming negativity of messages on youth social media. See www.wedontdothathere.ca to learn more and / or take the pledge. Shane L. S. Dennis is a musician, hip-hop artist, spoken word poet, and the owner of Unity Market on 25 Toronto Street. If you don’t know what Unity Market is all about, get yourself down there for some marvellous food, enjoy the art and music, and maybe get involved. Shane treated us to one of his poems, then talked about the vision for social change behind Unity Market. Topics of special mention: community gardens (including carrots), and taking responsibility for keeping our city spaces clean by picking up the trash ourselves. 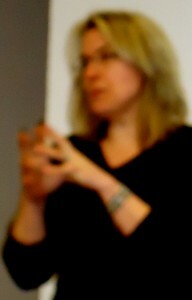 Professor Tanya Shute (our apologies for the blurry photo) spoke about Photovoice. In this project, homeless people were given disposable cameras and sent out to document what it means to be homeless. The photos they took, and comments in their own words, were used to create an exhibit called Hidden In Plain Sight. There have been 10 gallery shows, and at least one Film Festival award. The exhibit continues. 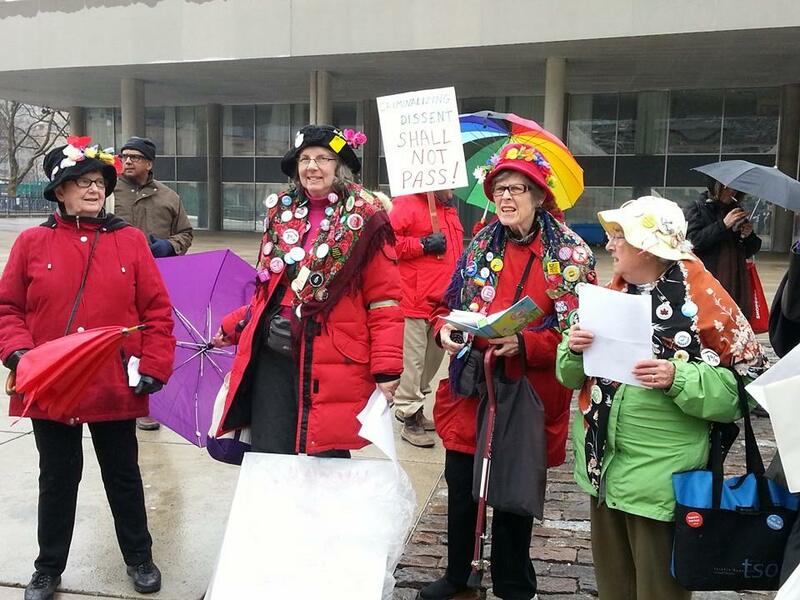 And here is Granny Molly speaking about the Raging Grannies movement, as well as the Barrie And District Raging Grannies. Granny Anita spoke on the strengths the Raging Grannies bring to community activism, and we all offered our helping voices in song. Nothing shows what the Raging Grannies are about better than a gaggle of us standing up in our daffy outfits, belting out a couple of witty but serious numbers. Thank you for inviting us LUSWA, we thoroughly enjoyed the evening.